"This is a nice change from your usual grilled cheese. It's made with mayo on the outside in place of butter and pepperjack cheese. It's a grilled cheese with a kick. Feel free to use your favorite cheese combination. 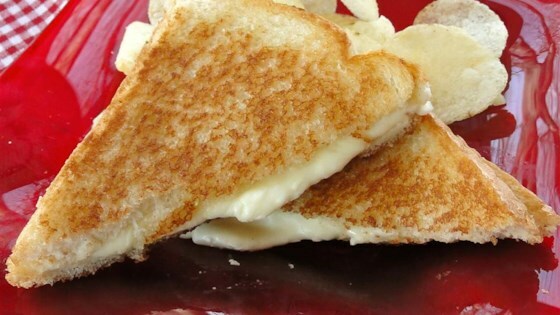 To make it kid friendly leave out the pepperjack cheese." Spread 1/2 the mayonnaise onto one side of a slice of bread and place, mayonnaise-side down, in a skillet. Place American cheese and pepperjack cheese on top of the bread. Spread remaining mayonnaise onto one side of the remaining bread and place, mayonnaise-side up, on top of the cheese. Cook sandwich in the skillet over medium heat until cheese melts and the bread is golden brown, about 2 1/2 minutes per side. I made this right away. Butter is better.